Build a chickadee nuthatch birdhouse for chestnut-backed and Siberian chickadees and brown-headed and pygmy nuthatches. 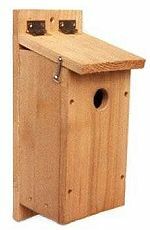 Make his nest box with red cedar, pine, or almost any soft wood. Use rough-cut wood stock so birds can grip wood surfaces. Attach a hinged roof for easy access to monitor and clean. Use brass shutter hooks to secure roof in closed position. Always use corrosion resistant screws and hardware. Make a floor 4″ by 4″ floor (inside) and 9″ floor to ceiling height (inside front). Cut a 1 1/8″ diameter entrance hole located 7″ above the floor (to top of hole). Drill or cut ventilation openings in the floor and under the roof. Install the chickadee nuthatch birdhouse in forests or groves on a tree or post with partial sun and shade between four and twelve feet high. Unless the box is well concealed, out of reach is best to deter the curious. Also see each particular bird species page. Remove the nest from the box in late summer or fall well after the brood rearing season is past. Store or leave the box installed and allow the box to winter over clean and dry. It might be used as a warmer by various birds. Make his nest box with red cedar, pine, or almost any soft wood. Use rough-cut wood stock so birds can grip wood surfaces. Always use corrosion resistant screws and hardware. Attach a hinged roof for easy access to monitor and clean. Use shutter hooks to secure roof in closed position. Always use corrosion resistant screws and hardware. Install a chickadee nuthatch birdhouse in forests or groves on a tree or post with partial sun and shade between four and twelve feet high. Unless the box is well concealed, out of reach is best to deter the curious. Also see each particular bird species page. Remove the nest from the box in late summer or fall well after the brood rearing season is past. Store or leave installed and allow the box to winter over clean and dry. It might be used as a warmer by some of these birds.